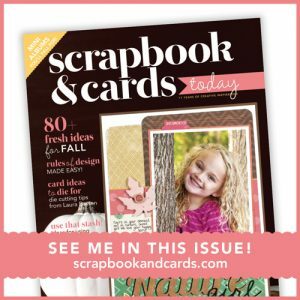 Hello Crate Paper friends! 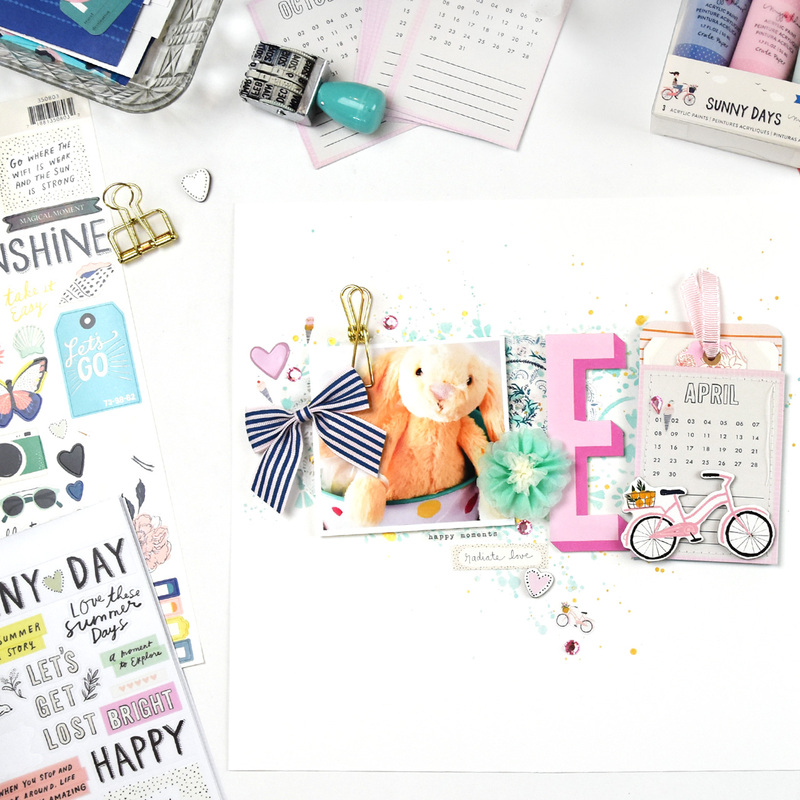 Lorilei here today sharing a layout I made about Easter using the gorgeous Sunny Days collection by Maggie Holmes! I can hardly believe Easter will be here soon! 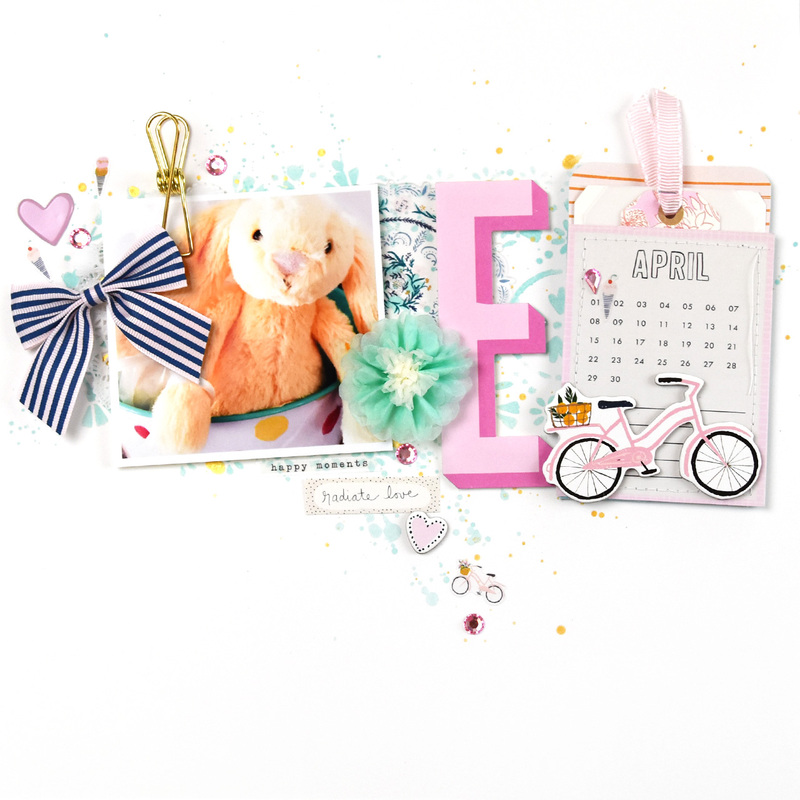 My whole layout revolves around the big pink E from the Sunny Days Die Cut Alpha pack. It was too pink and too perfect not to use! 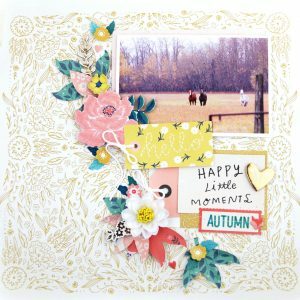 Once I had chosen it, I decided to make one of my favorite types of pages, having items “strung” on a line. I selected a photo of a bunny my daughter got for Easter a couple of years ago and went from there. 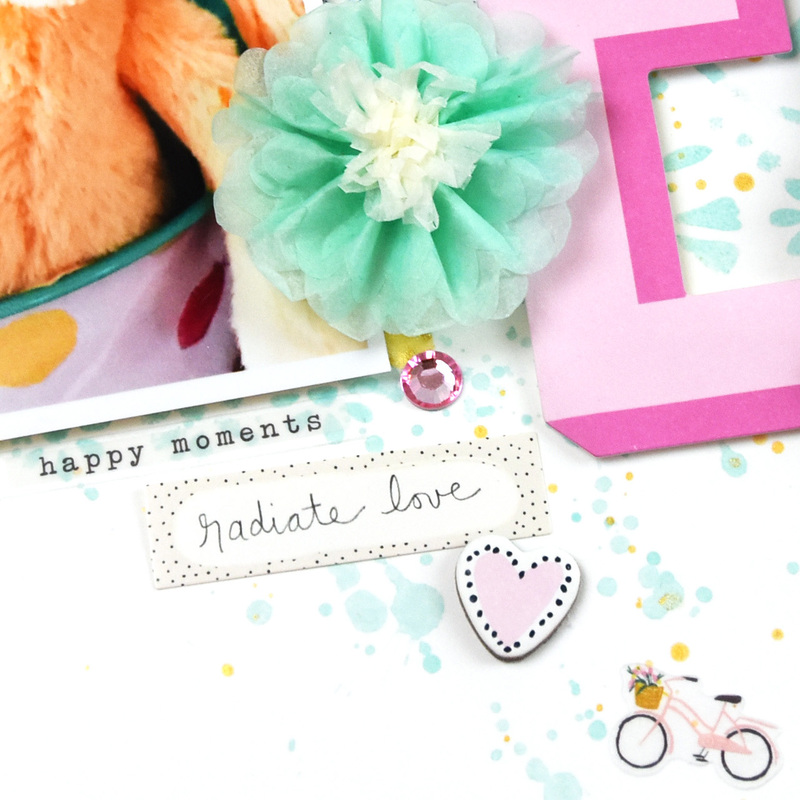 I chose a white background and added the Sunny Days mint paint through one of the stencils for a messy painted feel. I watered down the paint that was left over and added some mint splatters, and once the paint was dry I added some gold sprinkles too! 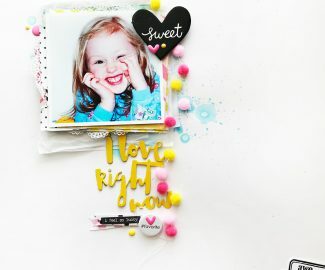 The paint and stencil add such a pretty unique look to the background! Next, I picked out one of the gorgeous fabric blue and pink bows and along with the big E, and mint paint that set my color scheme. 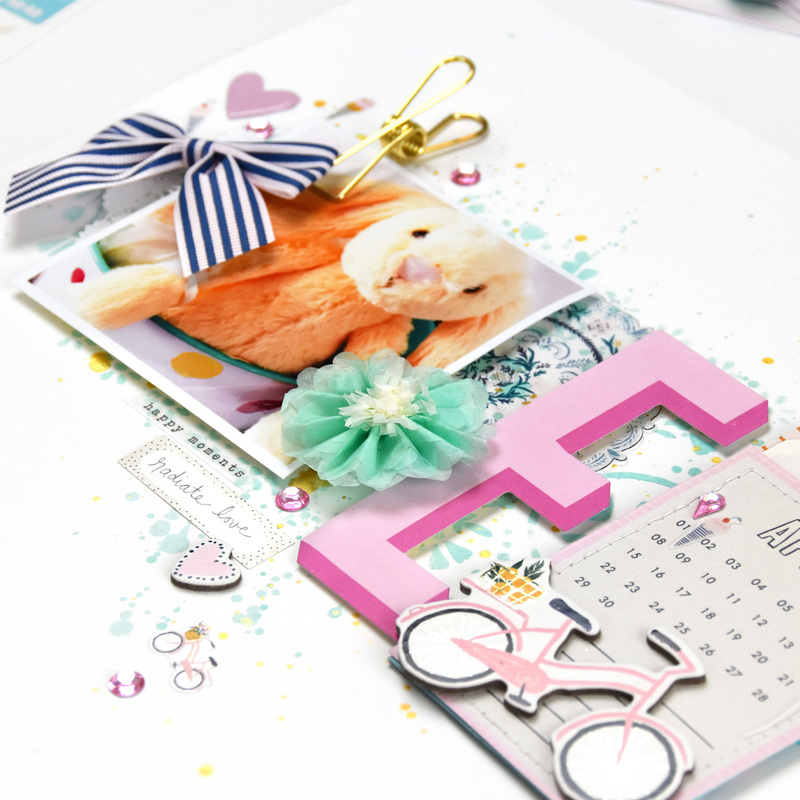 I added the round acetate piece from the Sunny Days die cut pack behind my photo for a pop of the blue. For the end of the line on the right side of the page, I decided to make a pocket for my journaling. I used the Pool Time paper, trimmed it down and turned it into a library pocket to hold my tags. Before I adhered the pocket altogether, I trimmed out the April card from the Weekend paper and stitched it to what would be the front of the pocket. I rounded the top corners of the pocket with a punch and then adhered the two sides with tape. 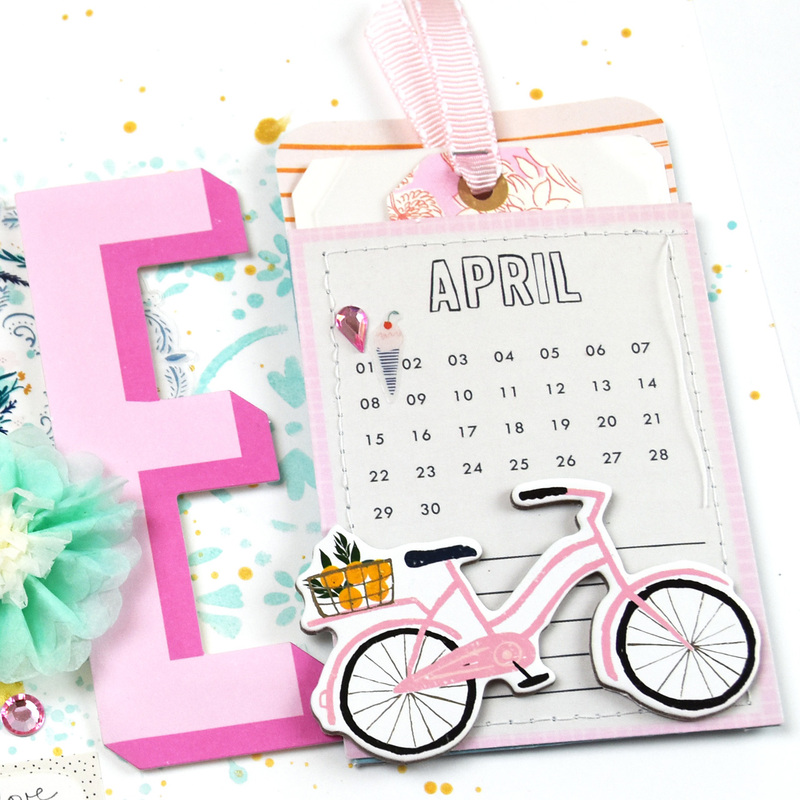 I fiddled around with loads of choices to decorate the front of the pocket and then found the super cute pink bike which fit perfectly! 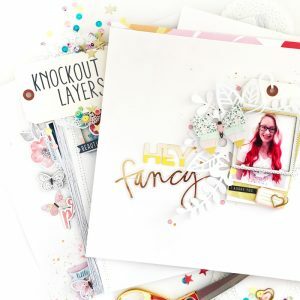 To finish off my page, I added one of the gold metal clips to the photo, the pretty mint paper flower, which helped to bring the mint background forward on the page and then I turned to the Sunny Days sticker book and rhinestones for little sprinkle details. I found the perfect small additions in the sticker book (happy moments clear sticker) and the radiate love word strip is from the 6×12 sticker sheet. 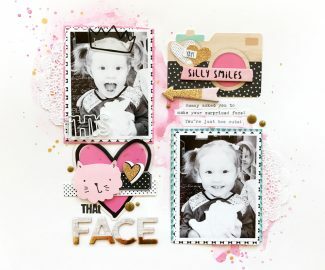 The pink chipboard heart finished it all off! 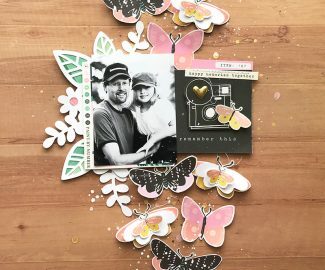 Sunny Days is such a lovely collection and can be used for so many photos and stories! Thank you for joining me today! Remember to take lots of photos of your Easter traditions and celebrations!